The United Nations says some 146,000 people have fled Myanmar into Bangladesh since violence erupted there Aug. 25. 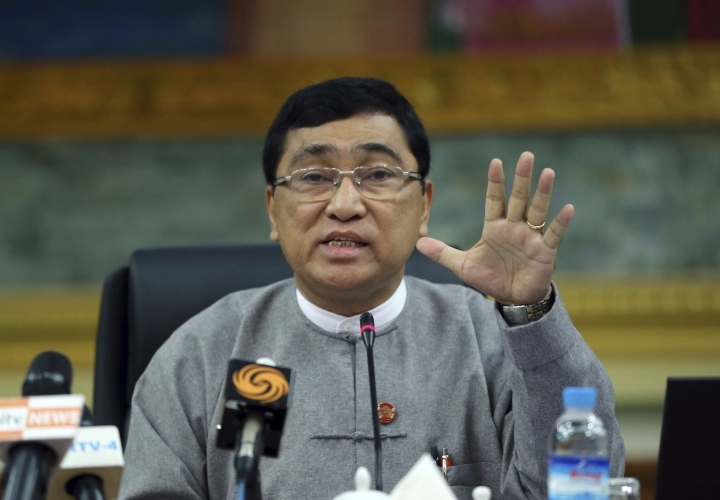 The Myanmar government's top security adviser says an insurgent group that attacked 30 police posts two weeks ago is trying to carve out a separate Muslim state from the Buddhist-majority nation, and the armed forces are using maximum restraint in their operations against them. 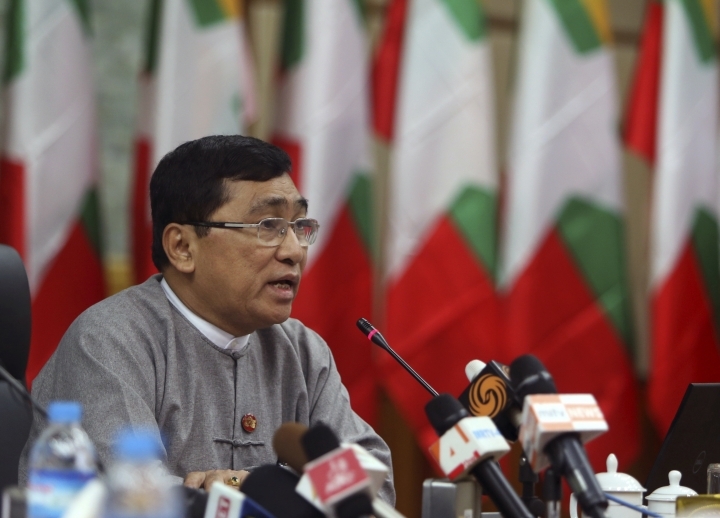 National Security Adviser Thaung Tun said at a news conference Wednesday in the capital, Naypyitaw, that security forces are making every effort to avoid harming innocent civilians. He was responding to accusations that the army and police fired indiscriminately on civilians and razed Muslim Rohingya villages after the attacks on the police posts in Rakhine state. A group calling itself the Arakan Rohingya Salvation Army has claimed responsibility for the attacks. The military says hundreds of people died in clashes following the attacks. 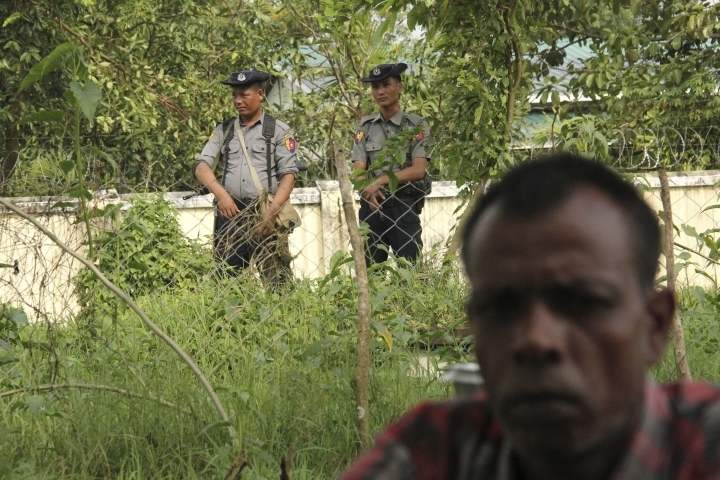 About 125,000 ethnic minority Rohingya Muslims have fled to neighboring Bangladesh to escape the violence. Norway's foreign minister says Myanmar's leader, Aung San Suu Kyi, and her government must allow humanitarian groups to distribute aid in violence-wracked Rakhine state, calling limits on their work "extremely serious." About 125,000 ethnic minority Rohingya Muslims have fled to neighboring Bangladesh after a military crackdown in Rakhine. 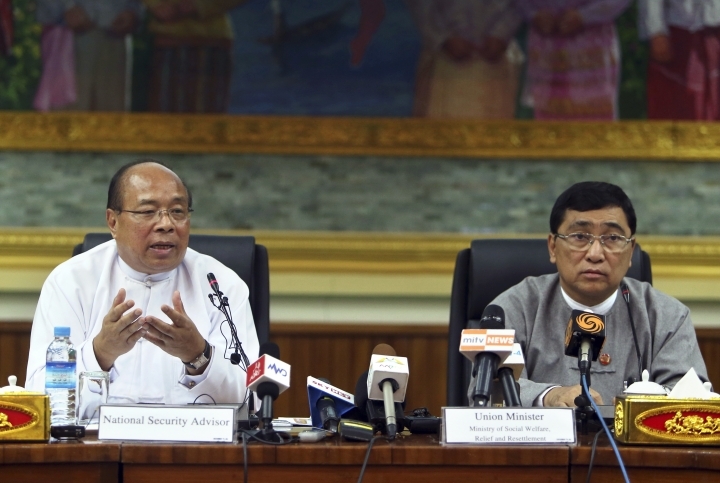 Myanmar says the crackdown is in response to attacks against police and paramilitary posts. Foreign Minister Borge Brende said Wednesday that the Norwegian government is deeply concerned about escalating violence and the deteriorating humanitarian situation of the Rohingya. He said "all groups must show restraint," but stressed that "authorities, under the leadership of Aung San Suu Kyi, have a particular responsibility to protect civilians from abuses, to stop the violence and to ensure humanitarian access." In a separate statement, Norway's Refugee Council said "full and unimpeded access to affected communities" is needed. Officials say Turkish President Recep Tayyip Erdogan's wife is heading to Bangladesh to oversee the distribution of aid to Muslim Rohingya refugees from Myanmar and to highlight the crisis. Officials from Erdogan's office said Wednesday that Emine Erdogan will be accompanied by her son, Bilal Erdogan, the family and social affairs minister, and senior Turkish aid officials during her visit to Rohingya refugee camps in Bangladesh. Turkish Foreign Minister Mevlut Cavusoglu is also scheduled to depart for Bangladesh and is expected to visit a refugee camp and oversee the delivery of aid. 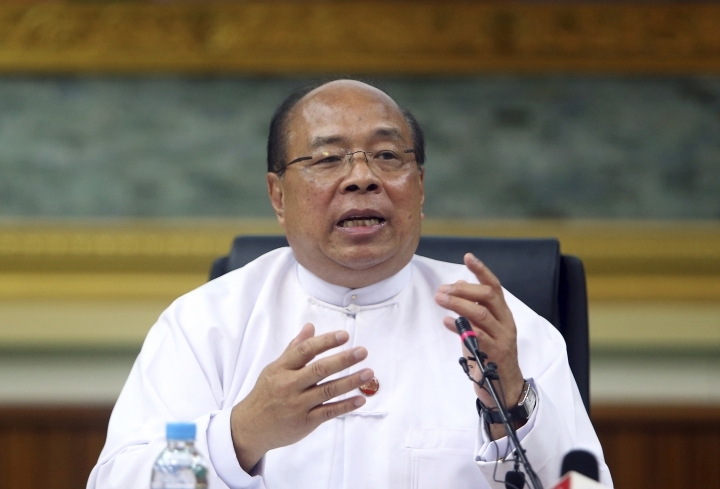 He said Wednesday that Turkey wants a lasting solution to the plight of the Rohingya. About 125,000 ethnic minority Rohingya have fled to Bangladesh after a military crackdown in Rakhine state that Myanmar says is a response to attacks against police and paramilitary posts. Turkish Foreign Minister Mevlut Cavusoglu says his country wants a lasting solution for the plight of Rohingya Muslim refugees from Myanmar. About 125,000 Rohingya have fled to Bangladesh after a military crackdown in Rakhine state that Myanmar says is a response to attacks against police and paramilitary posts. Cavusoglu said Turkey was determined not to "abandon" Rohingya and said his visit would help determine steps that can be taken to improve their conditions. He says: "God willing, together with the international community, a lasting solution can be found." Bangladeshi police say a trawler carrying Rohingya Muslims fleeing Myanmar has capsized in the Bay of Bengal, and at least five people have drowned. Police official Yakub Ali said residents of Shah Porir Island had recovered five bodies from the water on Wednesday morning, hours after the boat capsized around midnight. Ali said he believed the boat had been carrying about 35 people when it overturned, but could not say how many were missing or had made it to shore. Islander Mujibur Rahman said he had helped recover some of the found bodies and "many more are feared dead." A Bangladeshi disaster management official says the country will set up a new camp to accommodate Rohingya Muslims who have arrived from Myanmar since Aug. 25. But Shah Kamal of the Ministry of Disaster Management did not say when the new camp would be ready. He said Wednesday that the camp would be established in Tyingkhali, south of Cox's Bazar district and near the established camp in Balukhali where more than 50,000 Rohingya have been sheltering since October. Prime Minister Sheikh Hasina has asked officials to prepare a database with fingerprints for the new arrivals. Cox's Bazar official Ali Hossain said the plans were still under discussion, and the government was coordinating with international agencies to handle the "very complicated" situation. He said officials were visiting the area and, "if necessary, we will take 400 acres or more land for the new establishment. The Bangladesh government will take responsibility." At least a thousand protesters led by the hard-line Islamic Defenders Front and other Muslim groups are demonstrating against Myanmar's persecution of its Muslim Rohingya minority in the Indonesian capital Jakarta. The crowd, mostly men dressed in white and holding a giant banner and flag, has converged on an area of central Jakarta near Myanmar's Embassy. Police have put on a show of force, blocking streets around the embassy with vehicles and barriers. Jakarta police spokesman Argo Yuwono says up to 6,000 personnel are deployed to ensure security.